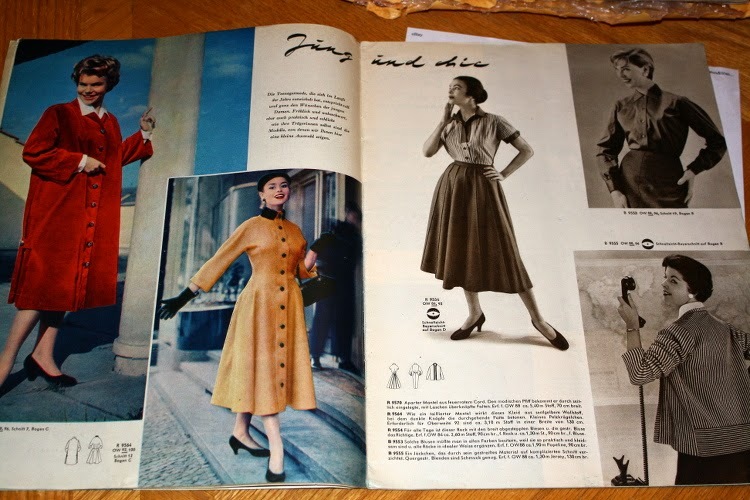 Ebay has been the greatest enabler in my quest to fill out my Burda back order wish list. I mostly look for more recent issue – pretty much only for the last decade or so – but once in a while I get excited by some older issues. 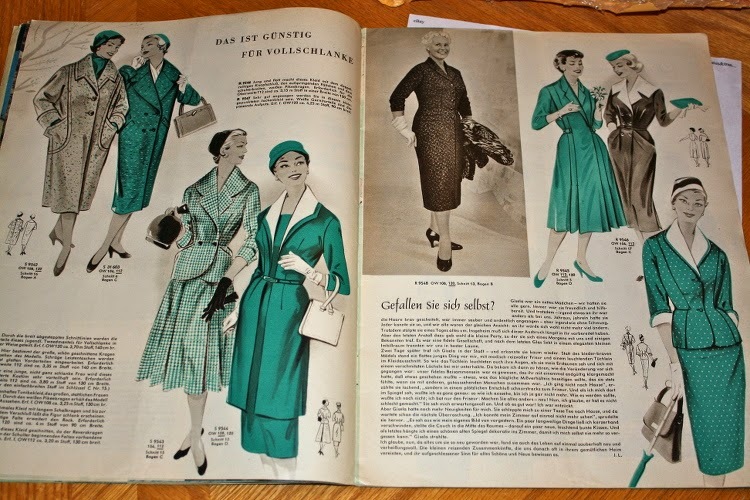 I have bought several magazines from the early 1970s because I was in love with the coat patterns, but my more recent purchase is much more exciting. 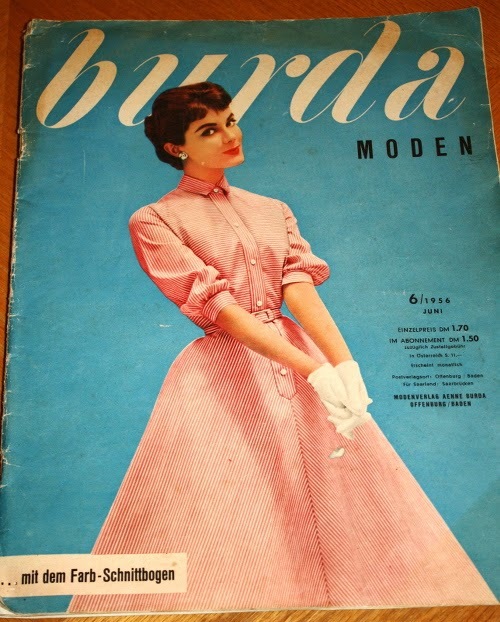 I found a few Burda magazines from the 1950s – in fairly good condition with the patterns included! 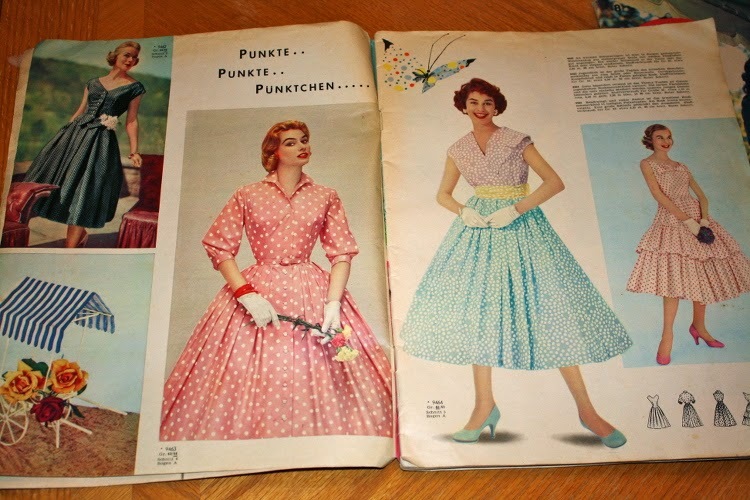 I don’t have a lot (well, any) other vintage patterns, but I love some of these styles, and I could totally see myself slogging through the German to make them. My sister was obsessing over the photography on the cover. 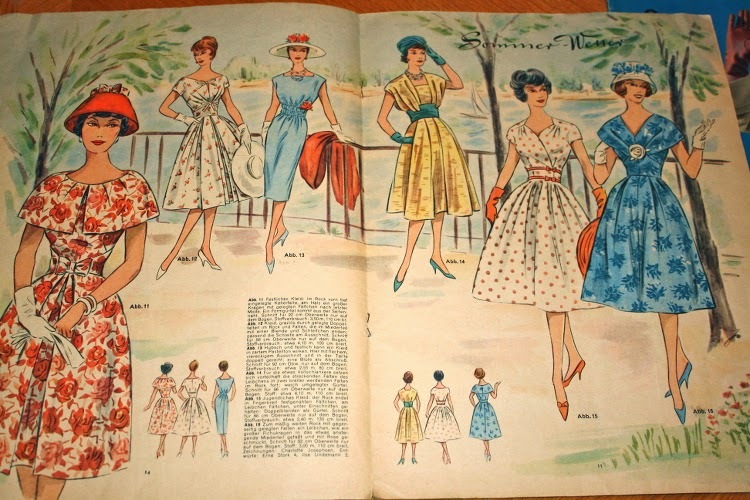 So many pretty dresses! So many. 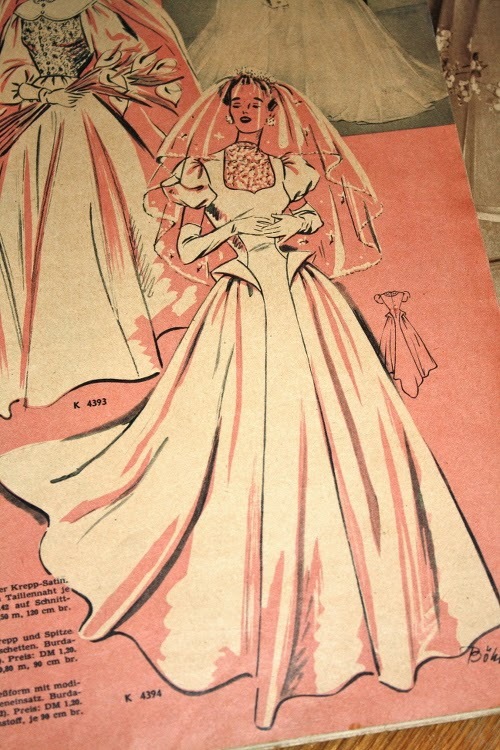 This is like the vintage version of the Royal Wedding dress. 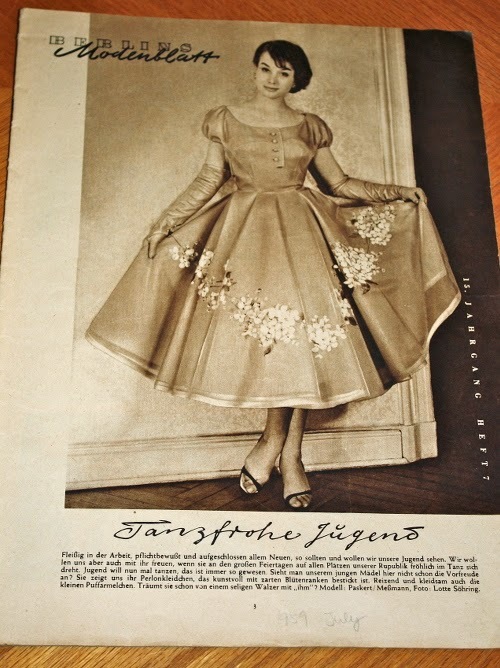 And look at the skirt on this gown! 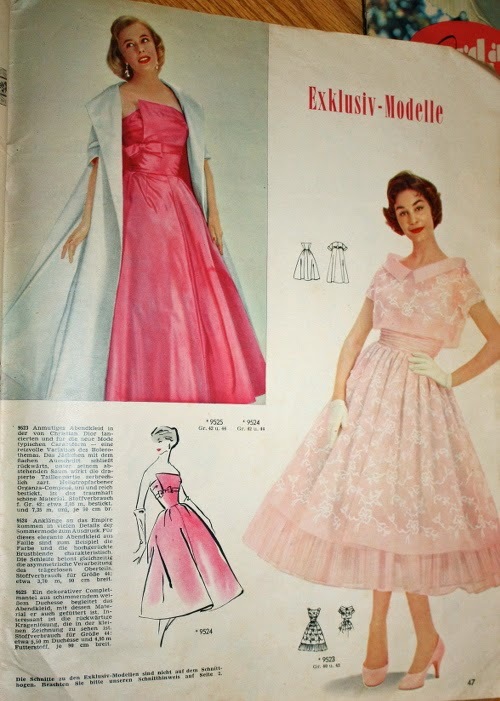 The poofy sleeves are so not my thing, but the train on the skirt is lovely. 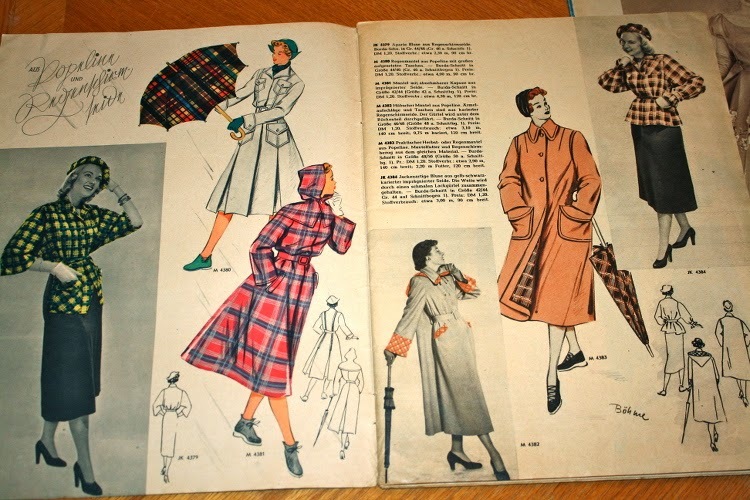 The hooded plaid raincoat might have inspired me to sew vintage. 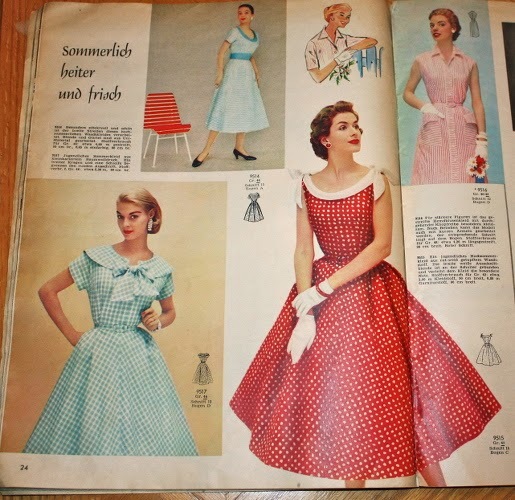 Cute dresses for daily life – love the blouse with the giant bow too! 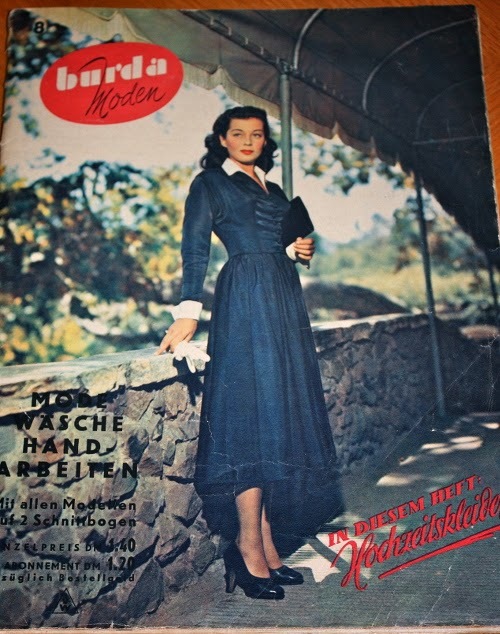 Ah, the Burda dirndls. Wouldn’t be Burda without them. 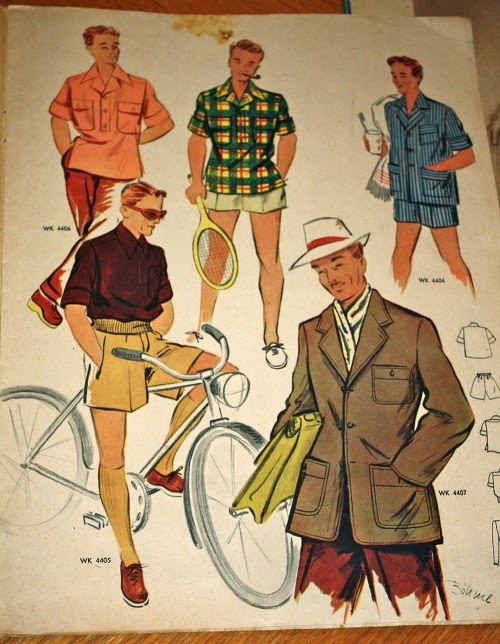 1950s men’s fashions. Those are some short shorts! 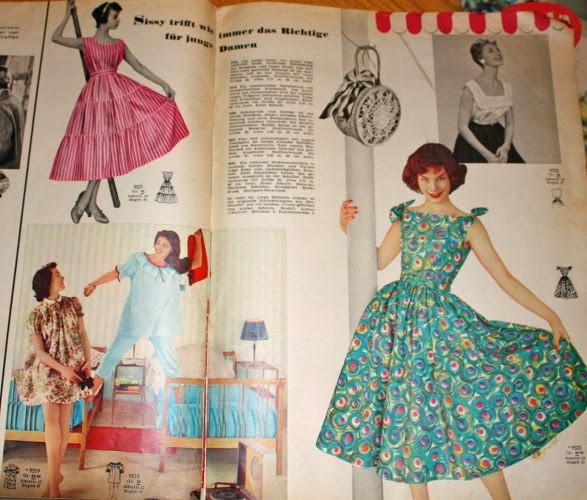 Nightwear from the 50s looks like evening gowns from today. 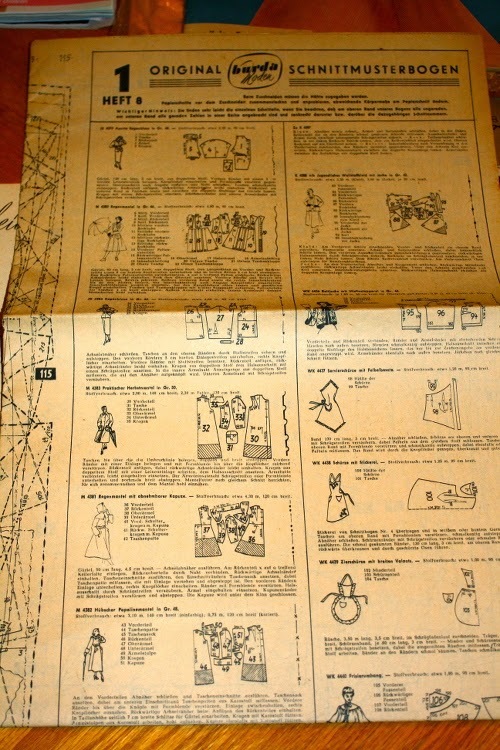 The pattern sheet and instructions were all-in-one in 1950. 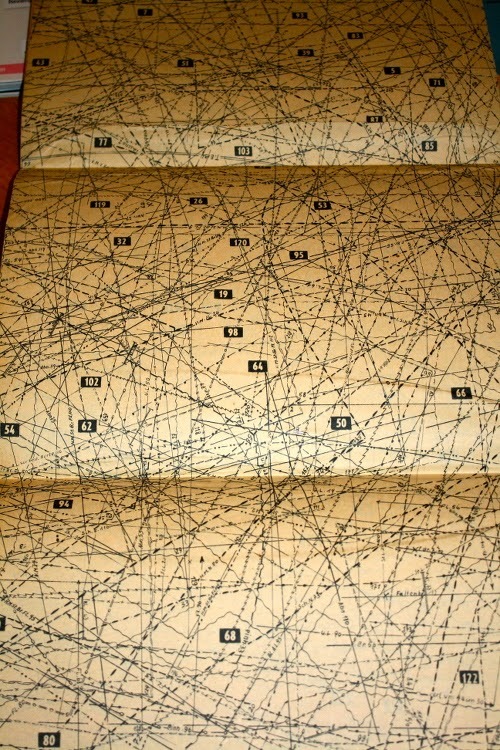 The tracing sheet. Everything is black. No more complaints over modern sheets. None. 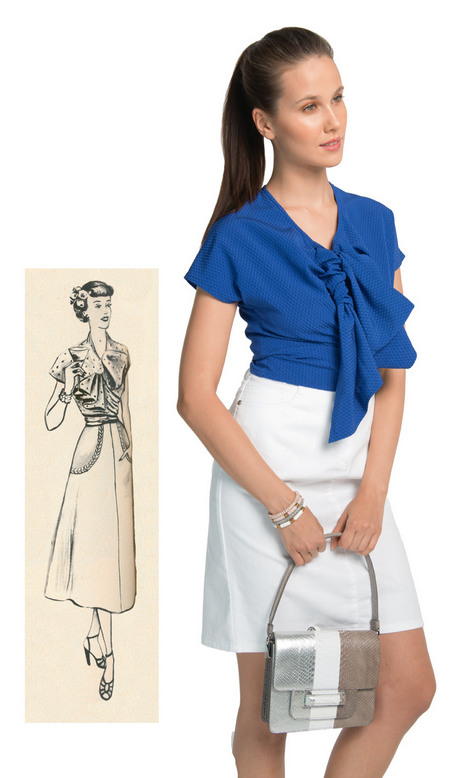 This is the Vintage re-print in the May 2014 issue. 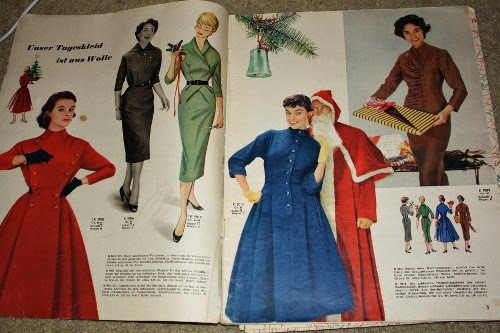 And, yup, I now have the original pattern in the August issue from 1950. 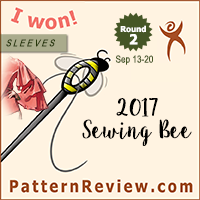 I was intrigued by this top, but getting the pattern twice in the same month? I think it is a sign. 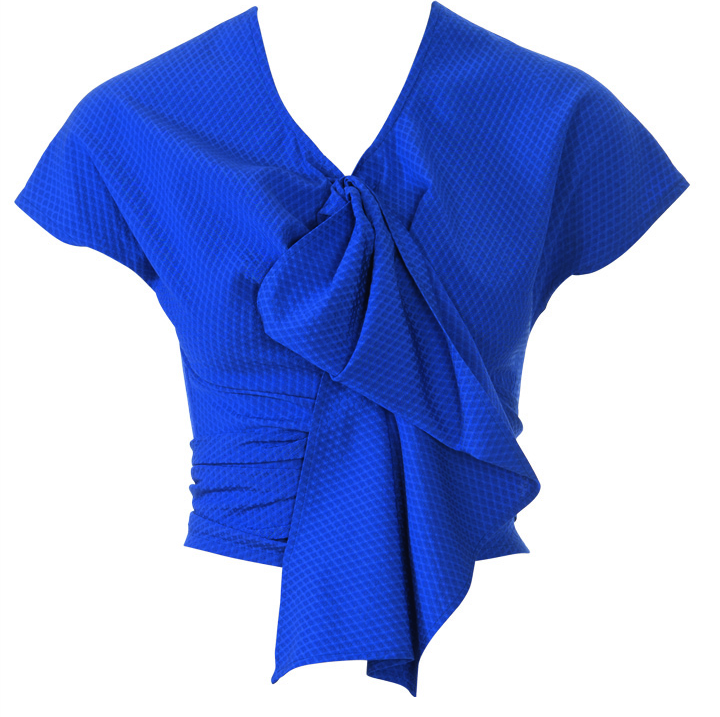 This went from my “maybe” list to my “must make” pile. especially the green one and the brown one on the right. 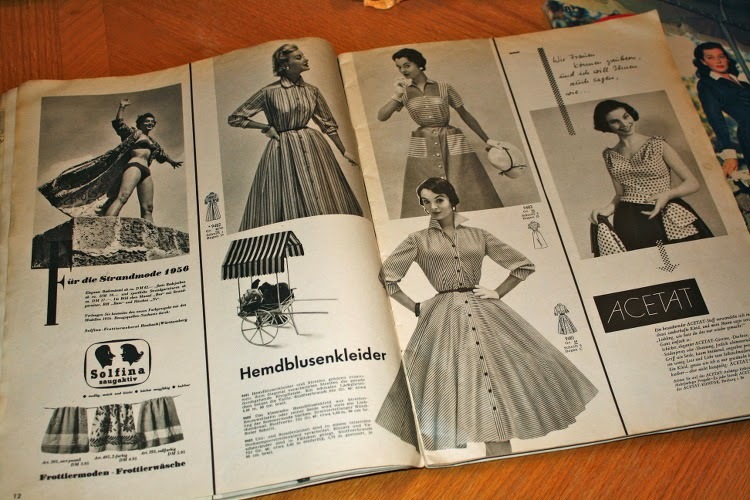 I wan to make EVERYTHING on this page! 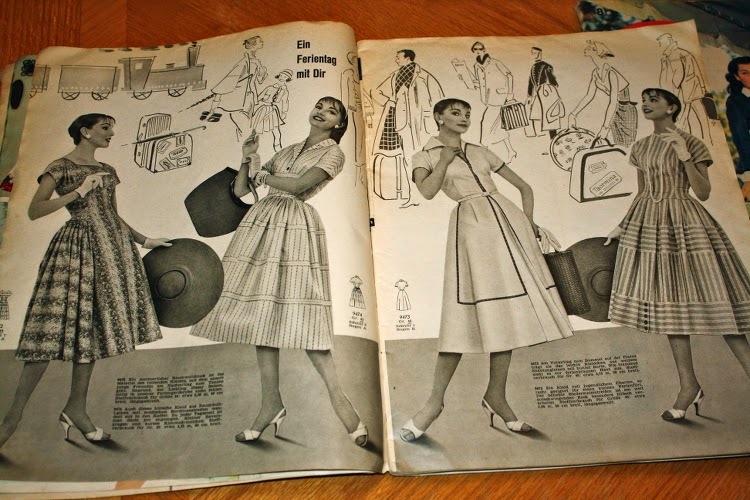 but my party clothes can come from the 50s for sure. 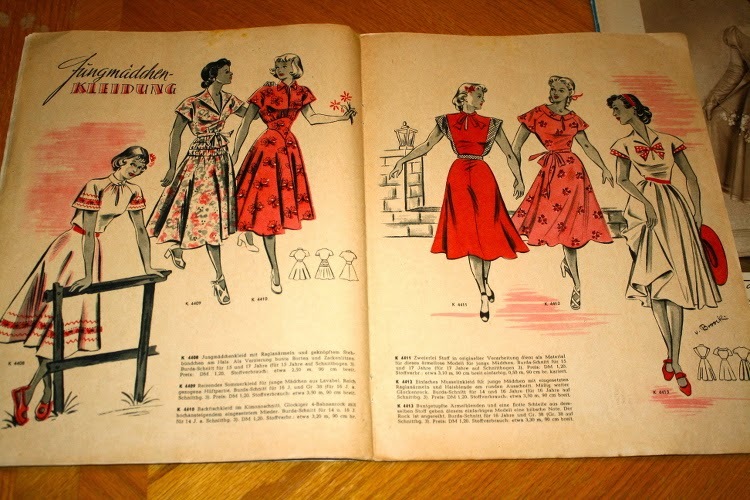 These designs seem a bit wild for the 50s, but they are sort of pretty. I don’t think the Exclusive designs are included, but they are really interesting. 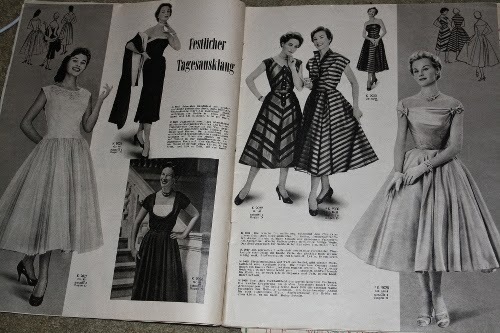 More lovely dresses from 1955. 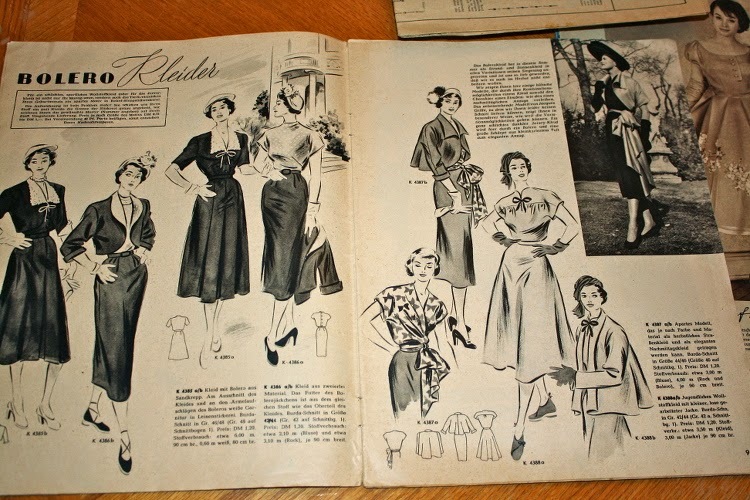 Loving these blouses and skirts too! So elegant and classy. 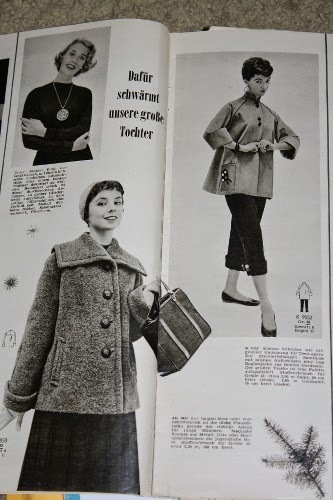 The wide collared coat is so cute! 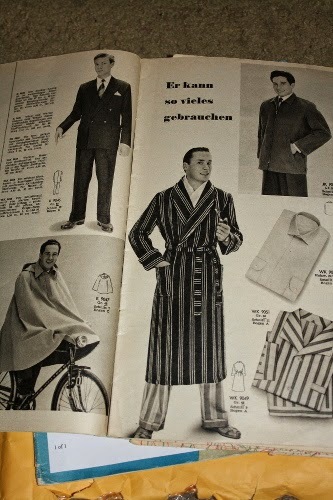 There are even men’s patterns – including a suit! 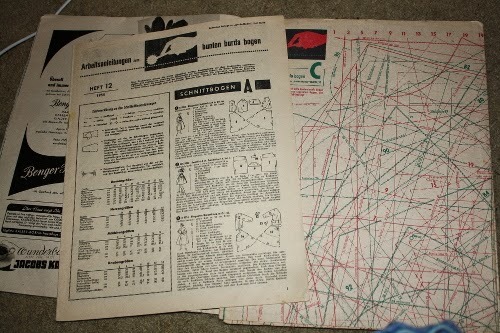 Old instructions and tracing sheets. 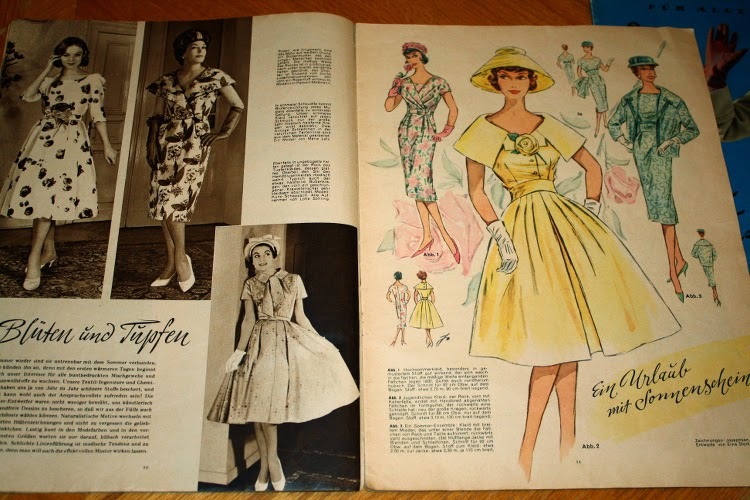 The sizes look to be very similar/consistent with current Burda sizing. Anyone know if that is really the case? 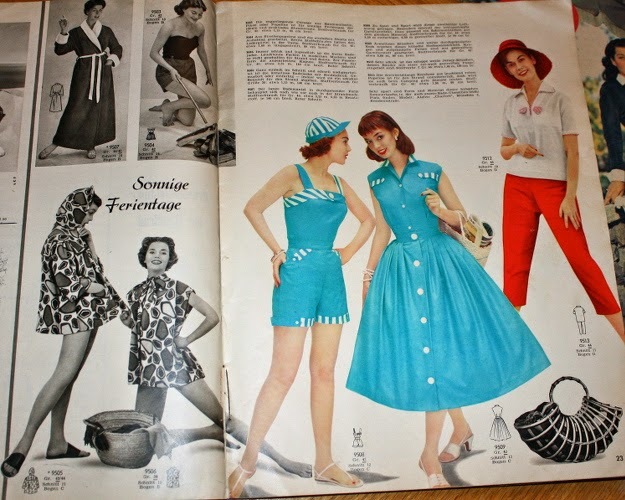 This issue is so cute and summery! 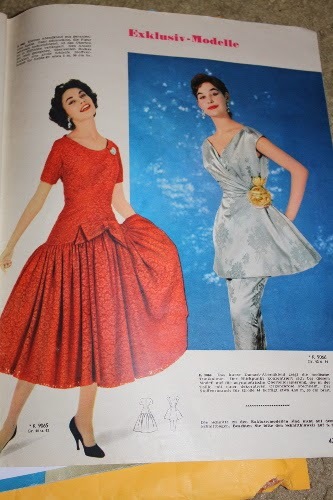 1956 was clearly the year of the giant poofy skirt. 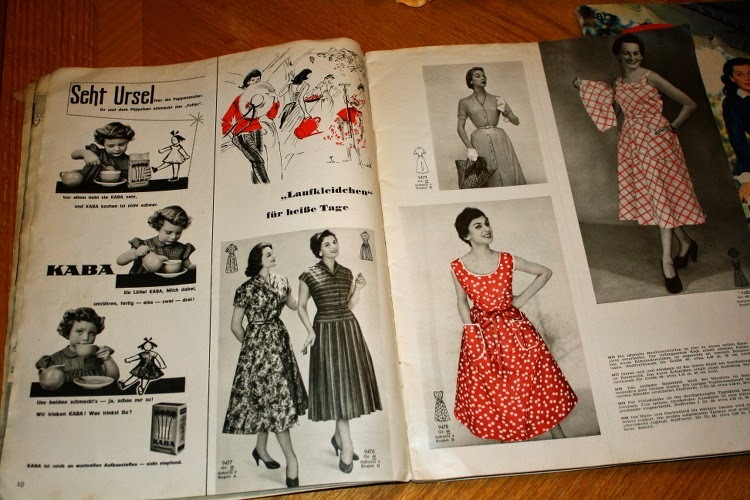 Love so many of the dresses on this page! The red on the bottom right – swoon! 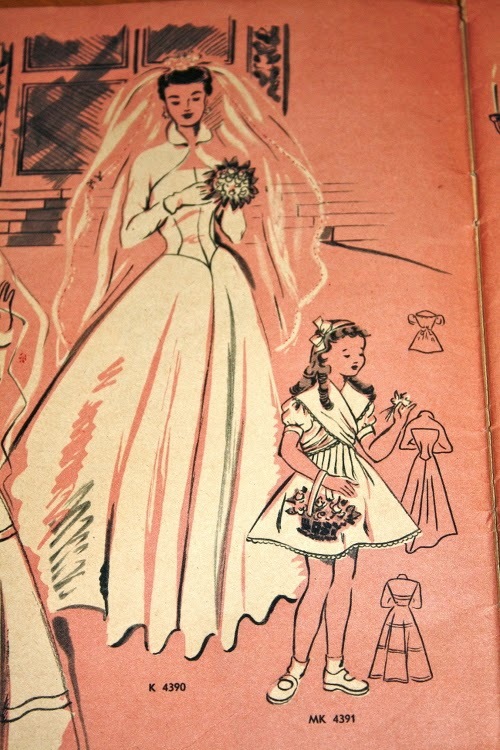 Even the less fantastical designs have fuller skirts than the earlier issues. 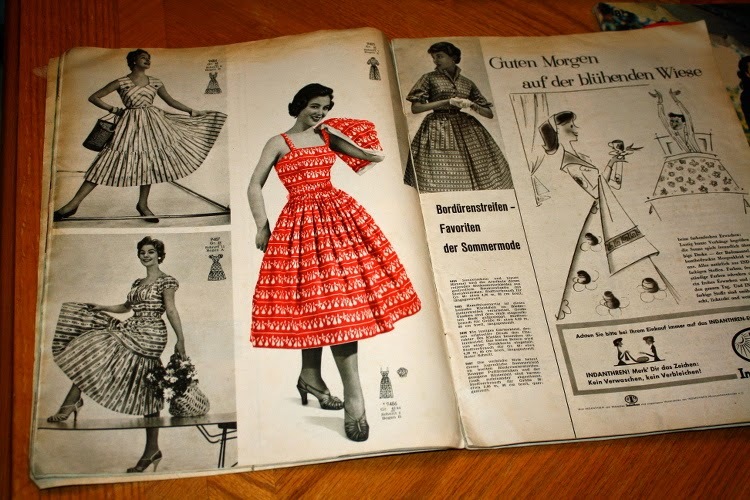 I know it is pretty simple, but I LOVE the red dress. Love it. Definitely going to make one someday. 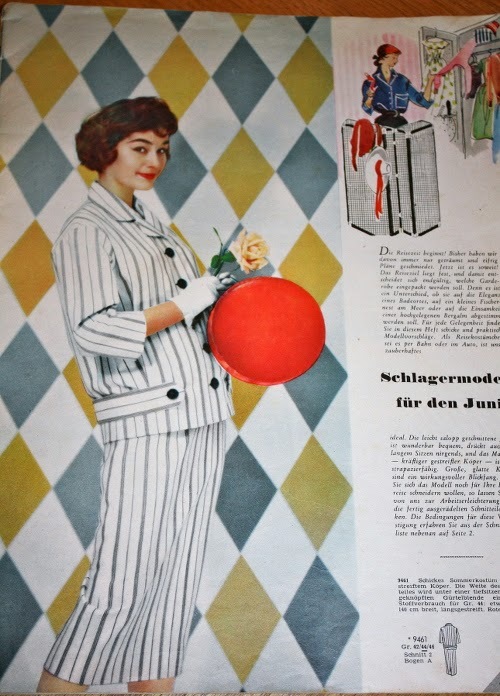 This suit makes me think of old movies I used to watch on TV. 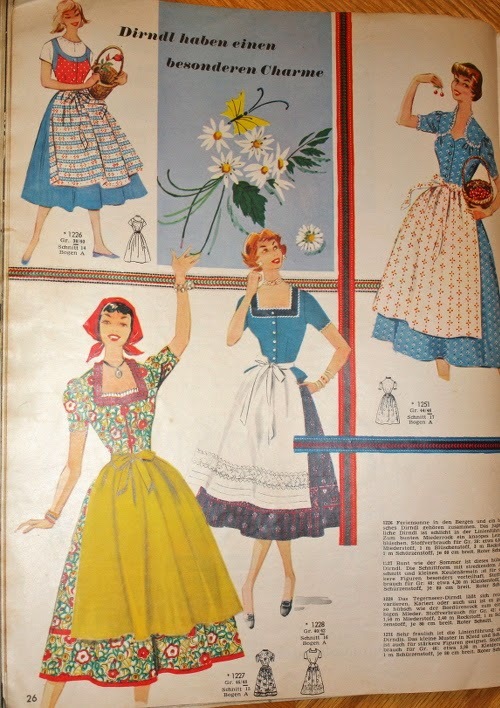 The around the house designs are less glamorous than in the issue from 1950. 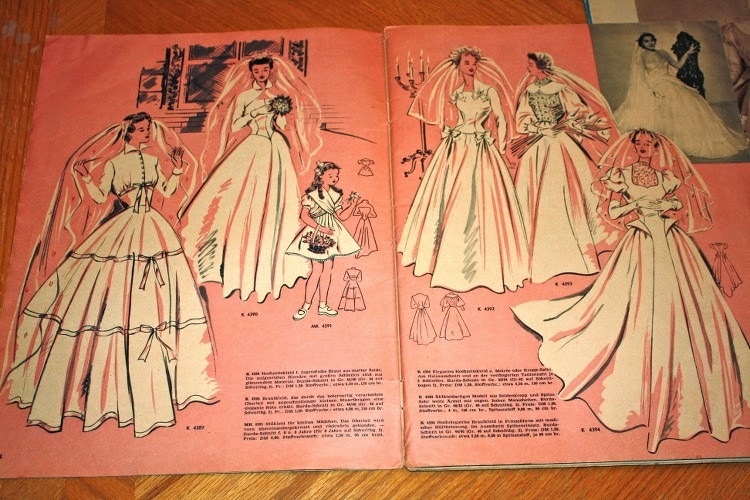 My mother couldn’t understand why I was so excited by vintage 1950s undergarment patterns. 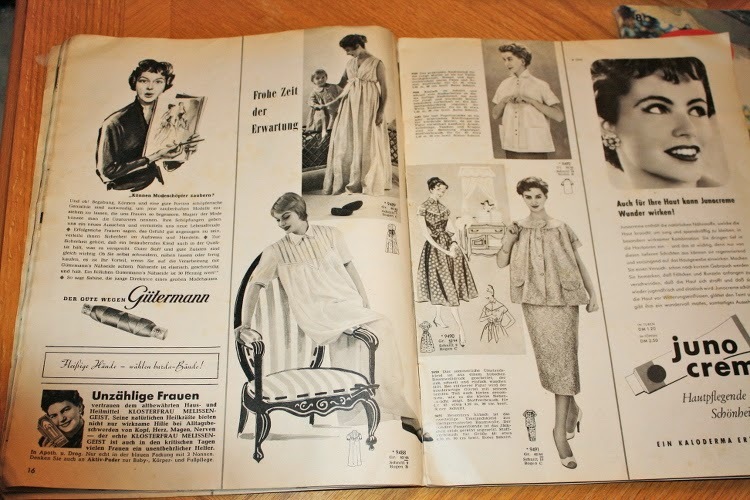 Clearly, if I am doing vintage, I want authenticity! I might need to whip out these capri pants for an upcoming costume idea. 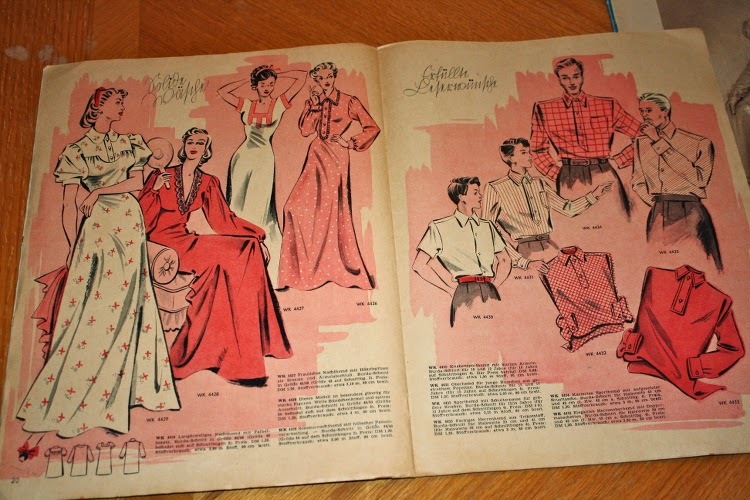 I think I love every red dress in this issue. but they are very pretty to look at! 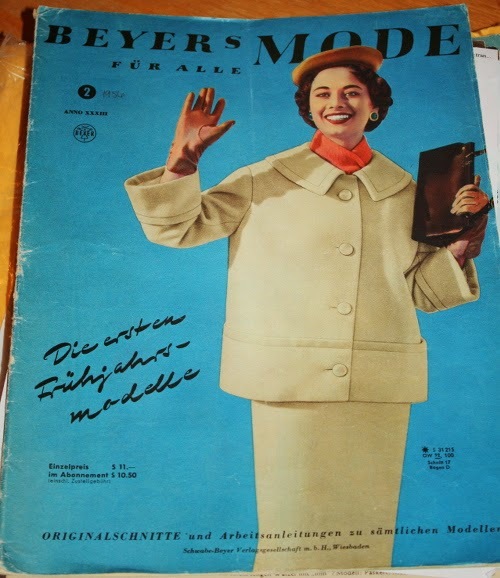 Beyers Mode Für Alle (Beyer’s Fashion for All) from February 1956. 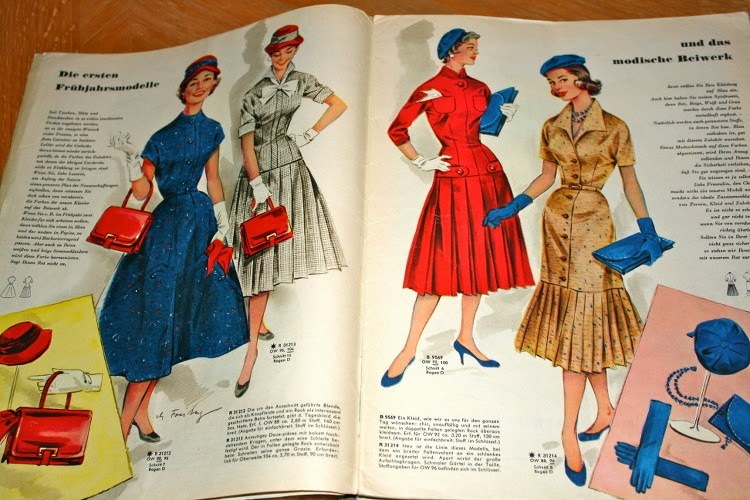 50s styles – wouldn’t be complete without the hats and gloves! Love the tan coat! 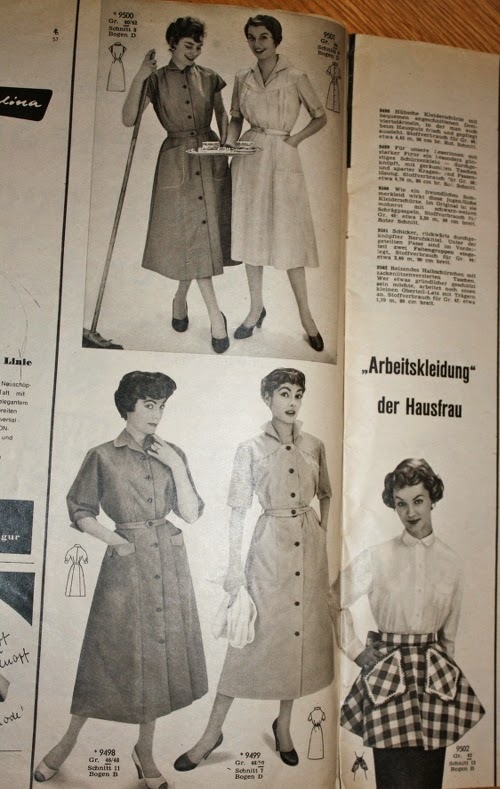 I really should make a coat with a swooshy skirt. 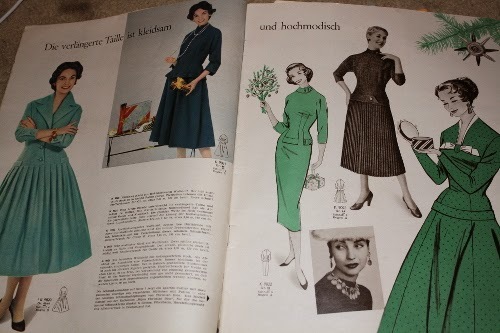 The green dress on the upper right is really pretty. 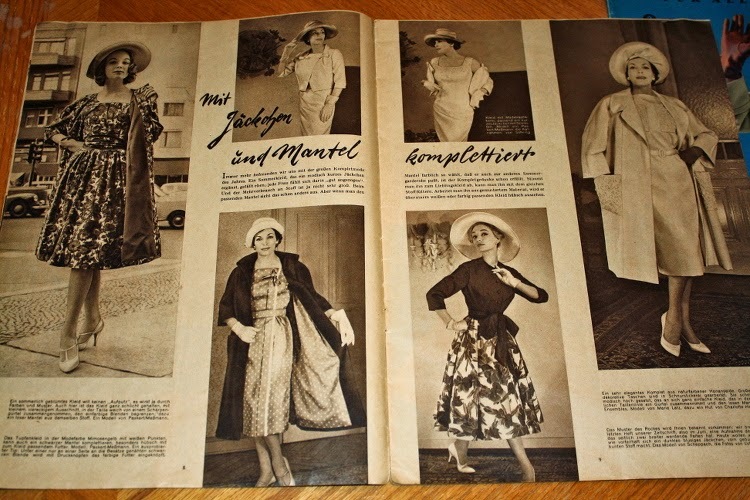 Berlins Modenblatt (which translates to Berlin Fashion Journal) from July 1959. 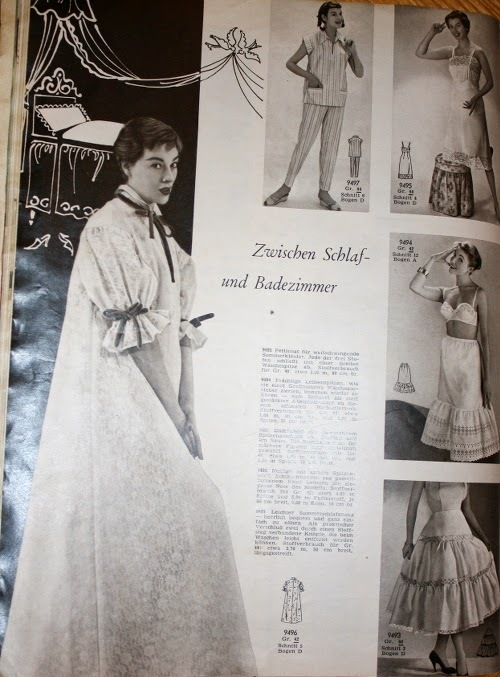 There is such an elegance I wish would return to modern clothing. 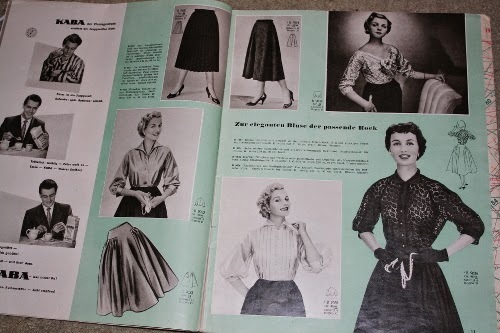 The blouse on the lower right is really pretty too. 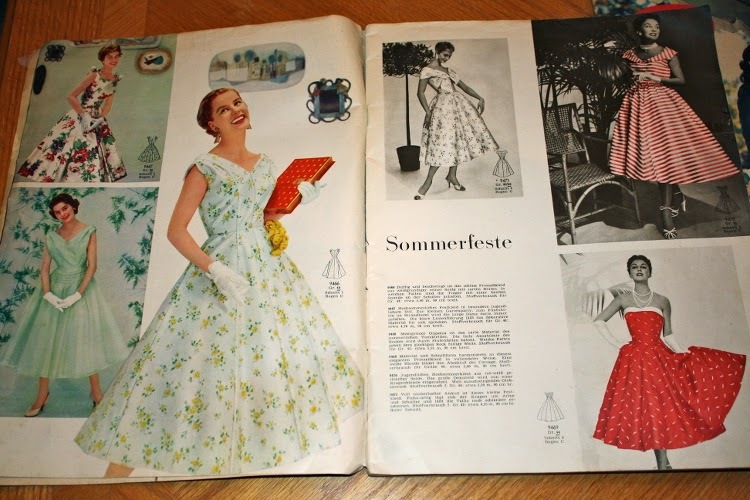 Loving the floral dress on the right page. 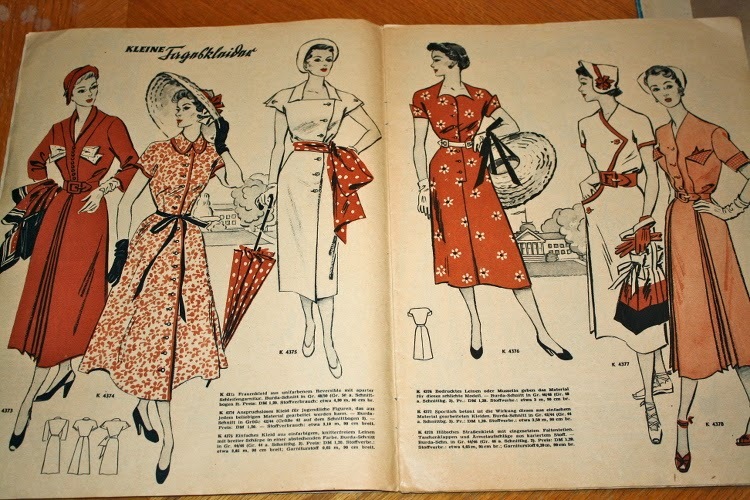 Might have to see if I can approximate it using patterns I currently own. So, um, yeah. 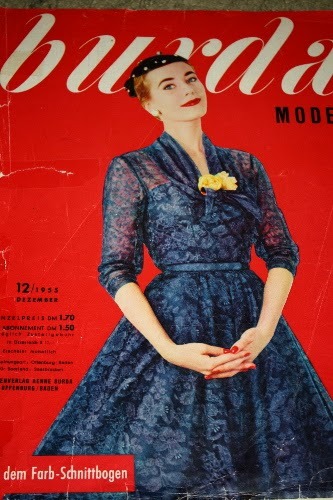 I never considered myself much of a vintage pattern girl, but something about the combination of Burda and 1950s elegance had me sold. 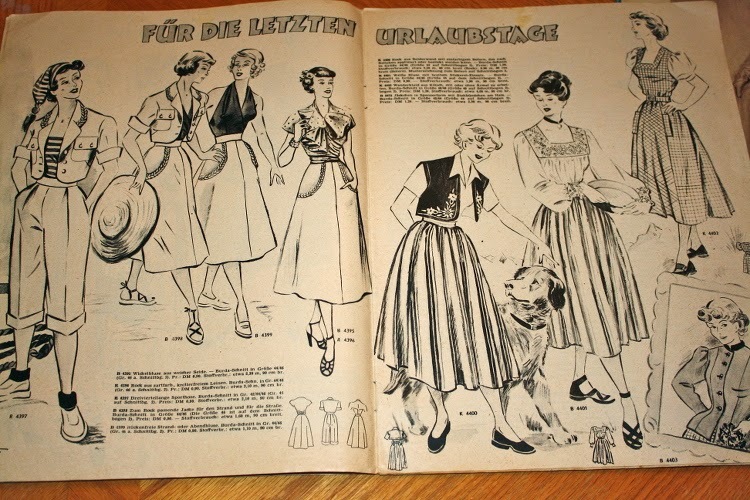 So I am now sort of inspired to tackle my first vintage pattern… even if I have to trace it, grade it, and ignore the German instructions. Thanks for sharing! Those pictures are so awesome. I'd love to step back and live in that time. 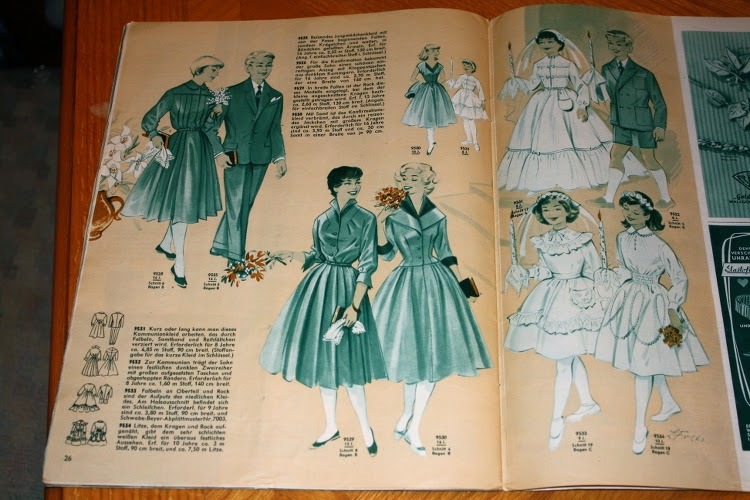 All those pretty dresses….. 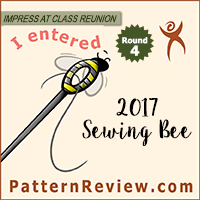 I made and am currently wearing a blouse made from the vintage reprint in the May issue! It's a little challenging to wear, as far as trying to figure out what goes where, but it's a fun little project. It was really easy to make, and I love it. I would recommend a couple of extra snaps, or closures on the front. I move around a lot at my job, so it's a little gapey in the front for me. Safety pins for the win.